Hello! It’s Friday, which means I get to create and to make customer thank you cards this afternoon… if my little toddler naps today. We went to her well baby checkup on Wednesday, and when I mentioned that my 2-year-old was skipping naps a lot, the doctor had the audacity to tell me that some 2-year-olds stop napping. No. Nope. No. When my oldest child stopped napping at age 3, I knew I was being cheated. Because all the baby books and baby classes said they would nap until age 5. So she stopped at 3, of course. And then my son stopped napping at age 3, and that was really just the worst. So I’m sorry, but I do not accept that my 2-year-old is done with naps. She’s getting a later bedtime instead. What were we talking about? Oh yeah. This super fun shaker card. I cut a rectangle out of the Whisper White cardstock with my Stampin’ Trimmer (2-3/4″ x 3-3/4″), then cut the background piece slightly bigger. Before I glued the Window Sheet to the back of the Whisper White piece, I embossed it with the Polka Dot Basics folder. I glued a piece of a Window Sheet, slightly larger than the window, to the back of the Whisper White cardstock. The background piece is stamped in LL Twist with the Marbled background stamp, which I just got, and which I now love. It reminds me of cake frosting. After I stamped the background, I attached Foam Adhesive Strips all the way around the edges of the background piece, careful not to leave any gaps for the shaker bits to fall out. The shaker bits come from the Party Hat Birthday bundle. 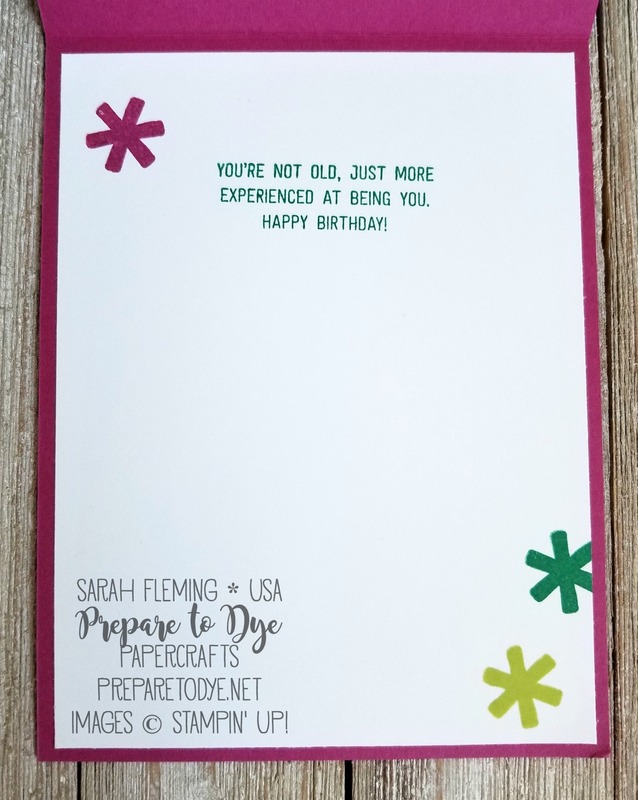 I stamped the party hat stamp with all the cakes, hats, and gifts on it in all three colors, Emerald Envy, Berry Burst, and Lemon-Lime Twist. There is a coordinating die for this stamp that cuts out all the little bits. So I stamped it twice in Berry Burst and once each in Emerald Envy and LLT. 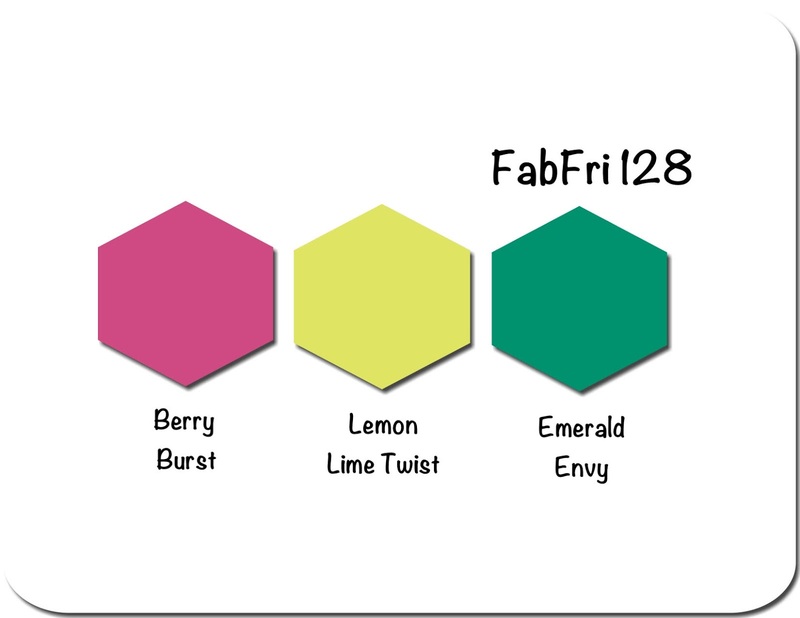 The Emerald Envy and Berry Burst ones are in the shaker, and I used three of the LL Twist ones for outside the shaker. Once the shaker bits were in and situated, I attached the Whisper White piece to the background with the foam strips, then attached the whole thing to the Berry Burst card base with more foam strips and my favorite glue. After I stamped the sentiment, I flagged one end with the Banner Triple Punch, then glued it to the card front. I added the little LL Twist bits with glue and Mini Dimensionals, then a strip of Myths & Magic Washi Tape and a strip of washi from Basics Pack 1. Then I added sequins and I was done. 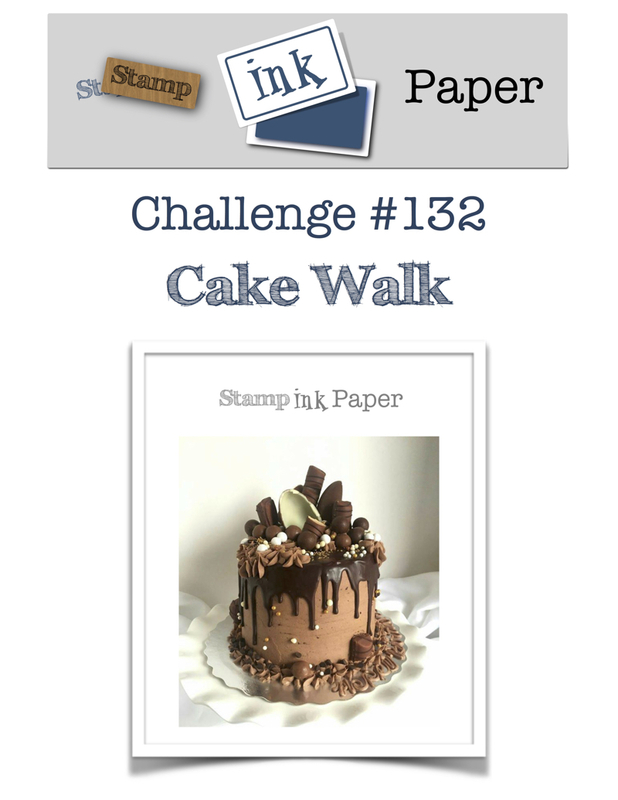 I’m entering this card in the Stamp, Ink, Paper “Cake Walk” challenge, and I got my colors from the Fab Friday color challenge. 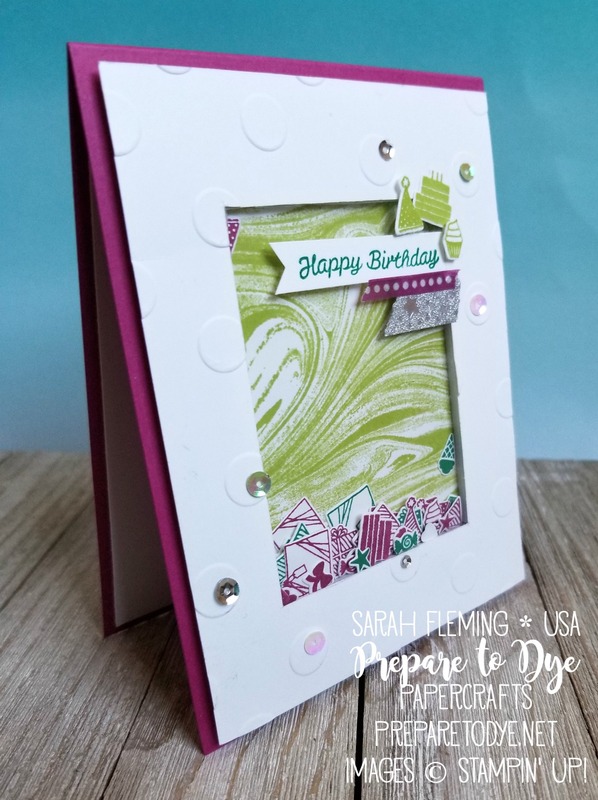 Perfect for a shaky birthday card! OK, BRILLIANT! 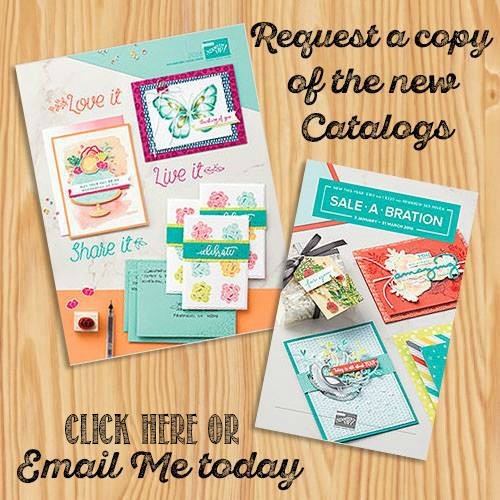 I love shaker cards, and yours is just perfect for both challenges! 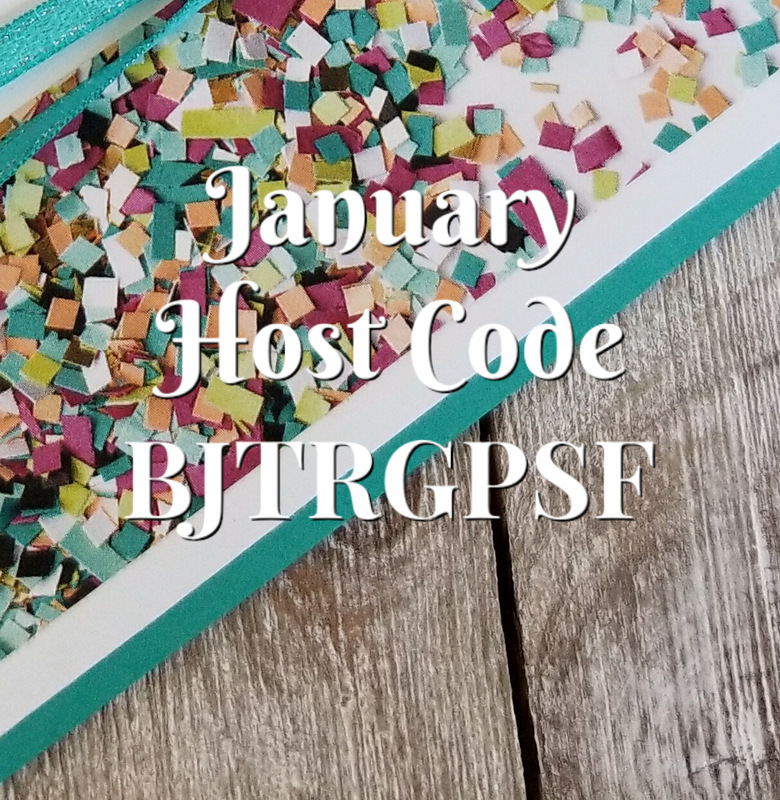 What a great way to use Party Hat – I might have to take a second look! Thanks so much for playing at Fab Friday! Too cute! Love that you made your shaker pieces from the little cake and party hats! Great idea! Thanks for joining us at Stamp Ink Paper, hope to see you again soon! 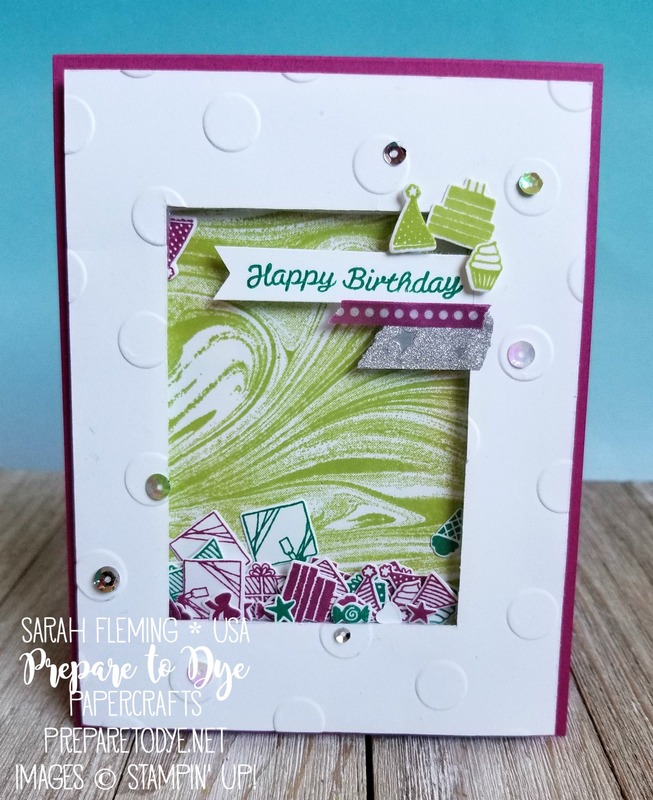 What a fantastic card to show off this set…the little bits and pieces are PERFECT for a shaker card! Well done! Thanks for sharing at Fab Friday! LOL! My 3 year old naps and naps well. I had a unicorn ;-) Scared to have another lol! Won’t get that lucky twice! And I love this, SUCH a fun idea for this set and our colors! Thanks for playing at Fab Friday! Usually the first is the hardest, so I wouldn’t worry *too* much about a second one. Haha.